This paper will discuss the relationship between Swiss-German contemporary video and installation artist Pipilotti Rist and the ethics of national identity in her work. I will argue that -contrary to accepted notions of plurality as fractured identity – Pipilotti Rist’s I Couldn’t Agree With Your More (1999) can be interpreted as evidence of an integrity of Rist’s Swissness between her subjectivity and the codified Swiss objective identities. These Swiss identities are historically and traditionally delineated in the pluralities of the national, the regional and the cantonal levels. I will argue that Rist models an ethical valency as to what is identifiable as a Swiss identity of integrity despite the fractured codifications (national, regional, cantonal, village) of accepted Swissness. This integrity of plurality in Rist’s work convinces that identity in plurality is experienced as an identifiable, processual interstice that is revisited, yet not as a fixed signifier, even as it refers to the codified signs of Swissness in an extended process of deferral. 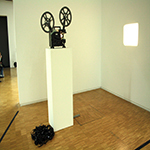 In the 2009 documentary The Color of Your Socks, Rist compares the topology of her doppelgänger in her film Pepperminta to the topology of the Swiss Alps. Rist has interrogated subjectivity vis-a-vis objectivity from the inception of her oeuvre. Art historical scholarship has examined the quotidian, the feminine, the utopian, the psychological and the cinematic implications of Rist’s oeuvre. Scholarship has also examined the role of institutions, the psychological, the political, the economic and the philosophical in the creation of national and individual identity. This paper investigates Rist’s ethical identity as an interpretation of Swissness through her 1999 work I Couldn’t Agree with You More, specifically through Aristotle’s excellence of ethics as a balanced interstice within dialectics. Aristotle, a student and peer of Plato’s, embodies a sobriety of rationalism in contrast to the specifically pantheistic spiritual aha erlebnis of Socrates and Plato. Thus this paper considers the deliberate mean, or choice, of Rist’s Swiss national identity with Aristotelian change as an increase in form (or, in this paper, identity) favored by virtuous actions, or choice. Rist’s form of Swissness is complicated by Leibniz’s pre-established harmony, where essence can be known independently of experience. Rist, in her subjectivity, is constitutive of Leibniz’s single monad reflecting an assembled, objective space of a plurality of monads. Kojève’s reading of Hegelian negation impelling desire to achieve unity will focus the examination of Rist’s Swissness as will Lacan’s ethics of the psyche. This paper culminates in the impunity of Rist’s video art with respect to Bergson’s durée, a conception of time, space and processes occurring in intellectual tensions and deferrals, or Aristotelian means, for an integrity of Rist’s subjective and Swiss wholeness in plurality. Rist’s impunity is confirmed by Levinas’ theory of the integrity of objective subjectivity in sacred discourse with the other.